The world has lost a key thinker and an inspirational person. The geographer Neil Smith passed away in New York early in the morning of September 29th, 2012. Neil’s work on uneven development, the production of nature, gentrification, and neoliberalism provide a crucial map for academics, activists and anyone interested in social justice and the city. Neil was a prolific writer and editor. His engaging writing is marked by its analysis, its humour, and its conviction. His Uneven Development: Nature, Capital and the Production of Space (1984/2010), New Urban Frontier: Gentrification and the Revanchist City (1996), and The Endgame of Globalization (2005) are all books that have pushed critical thinking forward while being useful books that would have a place on anyone’s bookshelf. 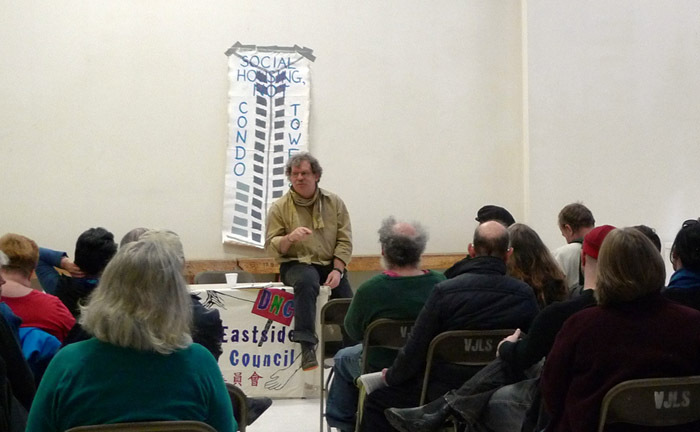 Neil lived and worked in New York and Toronto, but he also has a strong Vancouver connection: in the photograph above, Neil is giving a community talk that was organized by the Downtown Neighbourhood Council, VIVO, and Urban Subjects at the Japanese Language School in Vancouver in the spring of 2011. Neil’s intellectual and community generosity were boundless — on that visit to Vancouver he talked on three venues, culminating in a packed talk at VIVO where he elaborated his new work on the revolutionary imperative. His ongoing engagement with Vancouver included an essay in Stan Douglas: Every Building on 100 West Hastings (2003) and A Manifesto for the Poetry of the Future (2011). In his late work on revolution, Neil’s historical and spatial analysis merges with his belief in the ability for revolutionary agency to crack the forces of injustice and capital. “Neoliberalism is dead but dominant,” Neil speculated, but for that same reason there is much to anticipate in our time of crisis: “the future is indeed radically open in a way unprecedented just months ago.” Sadly we won’t have Neil in that future, but his spirit and his works are guideposts for all of us. The website at the Centre for Place, Culture and Politics at CUNY, which Neil founded and where I was lucky enough to work with him, has many moving tributes pouring in. Posted in Gentrification, Housing, News. Bookmark the permalink. Neil Smith profoundly shaped the way I have come to understand the urban condition and struggles for justice in the city. It is so upsetting to lose him. He will be missed. We lost a great thinker and a great human being. I had the privilege of meeting Neil Smith at York University (where I taught and where he had been invited to speak students). It was one of the most interesting and humorous lunches I’d ever had. I am very saddened to hear this news.